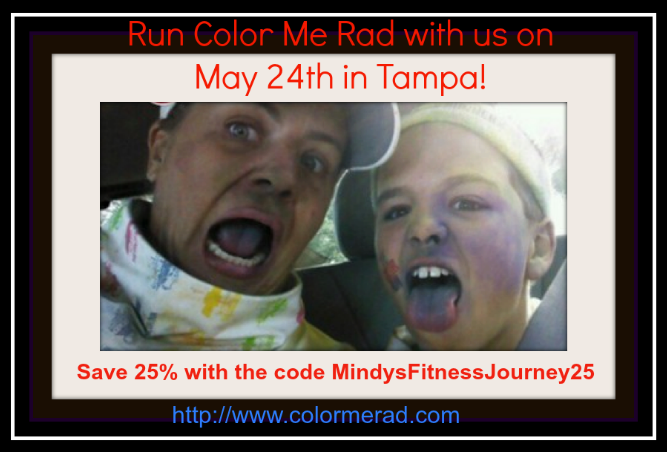 Mindy's fitness Journey: Color me Rad! Giveaway and race info! 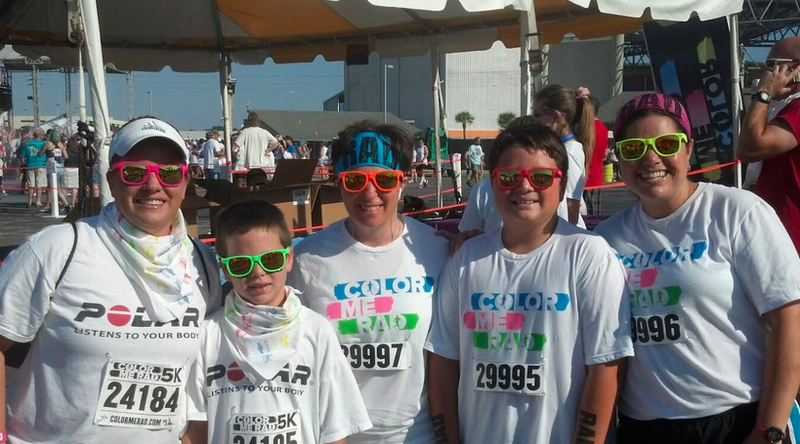 Color me Rad! Giveaway and race info! disclosure: I was given 4 registrations for this race and two to giveaway to a reader. All opinions are my own. Here we are before the race looking so bright and clean! 1. Dress in white! Wear as much white as possible. It will allow you to get as colorful as possible! 2. Get there early and stay late! Make a day of it. It's so much fun to enjoy the music and color before and after the race. Don't be in a hurry! 3. Bring your camera or phone but put it in a plastic baggie. You will want to take tons of pictures and video. It's a blast. 4. Don't run for time. If you are a runner who only wants to PR, I would skip this race. It's not meant for that. It's a chance to get your mom, dad, kids, and neighbors out to have fun. There are walkers, runners, and even some who skip. It's just fun! Getting pumped up to start! It really was amazing. I hope that they will join us again this year on May 24th. We cannot wait til this year's. We will be running this race on May 24th in Tampa. There are many other places where this is run. You can win 2 entries to run this race in your city in the rafflecopter below. 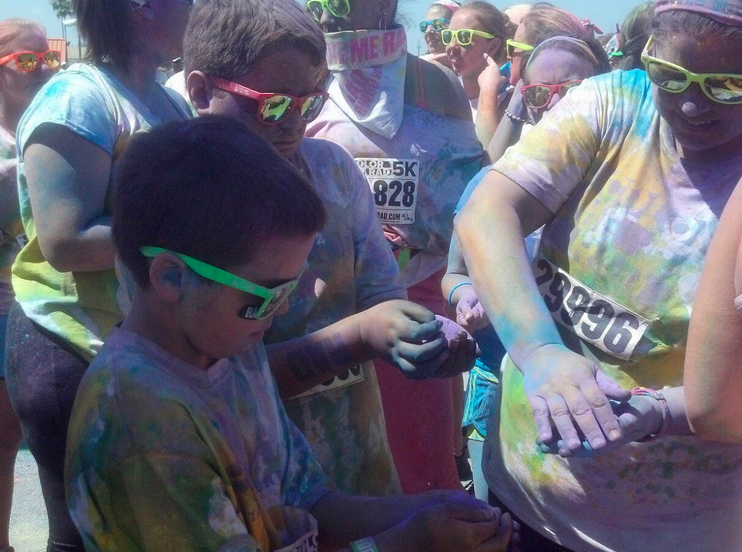 Have you run a color race? Why would you want to? Sounds like fun! I'll have to add this to my run bucket list. You should... it's a lot of fun! Did you enter to win... You should! Oh your son would LOVE this! My son counts down the days!! It is so very much fun! I haven't done a color race before (finally did my first mud run lat weekend!) and these look like so much fun! 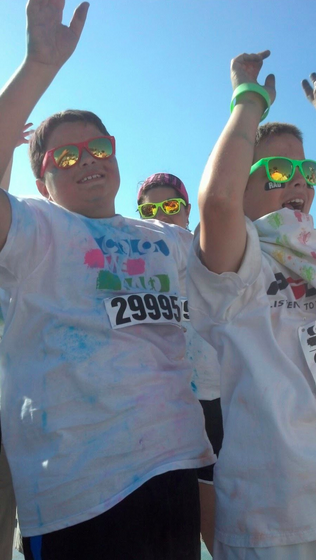 Color Runs are my favorite race to do with the Tampa Trio :) Love them!! We need to meet up this year for sure! 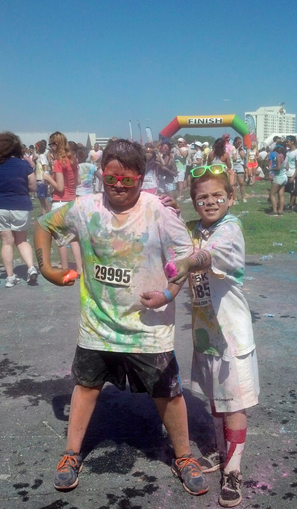 This will be my first color run and my sons first 5k ever!! So excited! ! How awesome is that!!! Have a blast! Wow, the Color Me Rad event sounds like a lot of fun for the family, I should definitely think about checking this one out and you get 25% off! Thanks for sharing your thoughts.